Welcome to a small set of missions related to the USAF's use of the U-2 over North Vietnam during the mid-1960s. This mission pack was inspired by Giles Whittell's excellent book Bridge of Spies. The following missions are available in this pack; fly as the U-2 pilot over key strategic targets in North Vietnam, avoiding a multitude of SAMs and interceptors that attempt to engage you, or fly as a pilot of the Vietnam People's Air Force and attempt to 'down' the U-2 as it violates your airspace. Each mission takes place early in the morning, in daylight conditions with broken cloud. Note that daylight operations were required to assist the array of cameras on board the U-2. For each mission, waypoints are provided to guide you. U-2 Grand Tour In a U-2A, take off from RTAFB Ubon and head, at altitude (~70k ft), for the border with North Vietnam, south of the disused airbase at Dong Hoi. Then head north towards Hanoi, before heading south-east to Haiphong, and then turn south-west for the long trip home. 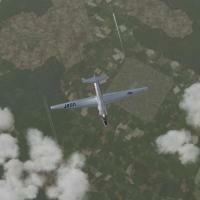 U-2 intercept (MiG-19) Attempt to intercept the U-2 as it enters your airspace, south-west of Dong Hoi. Depart from the VPAF airbase at Ben Loi, west of Vinh Son. U-2 intercept (MiG-21) Using the more advanced MiG-21, attempt to intercept the U-2 as it continues to make its way north to the capital, Hanoi, and then escapes south and west via Haiphong. Depart from the VPAF airbase at Bai Thuong, south of Hanoi. Thank you to all those modders who have provided the prerequisites I have used in this mission pack. If there are any problems with these missions and my own modifications, then please contact me directly, not the authors of the prerequisites. Details of optional enhancements to the game engine. Details of changes required to various models INI files to set-up flight characteristics and weapons management. New Target definitions and updates to Type definitions. 1.0.1 Added U-2 ClimbSpeed details in readme, to fix missing install instruction.